All samplers conform to ASTM D4057 (formerly ASTM D270), D6074 or ASTM D1265 specifications. Click on the image to view a larger photo of the instrument. 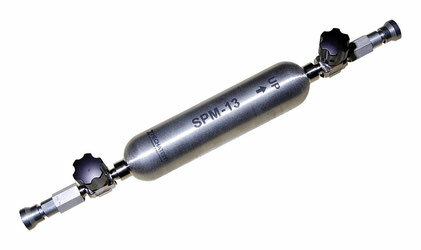 Welded stainless steel cylinders for obtaining representative samples of liquefied petroleum (LP) gases. Two-valve type (1/4 IPS), with 20% outage tube and built-in pressure relief valve factory preset between 540 to 600psi (38-42 kg/cm2). Constant Pressure Cylinder is a floating piston cylinder designed for applications which require a constant pressure for the gas or liquid sampled. Liquid or gas configurations are available in 300cc, 500cc, and 1000cc sizes. Sample Cylinder Cases offer secure transportation for our Spun End and Ultra-Seal Sample Cylinder products. The cases are offered in many sizes in unbreakable, water-tight, chemical resistant or corrosion-proof design. 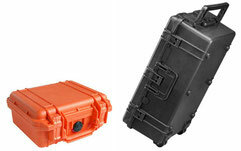 Sample Cylinder cases are black ultra-high impact cases with dust-proof ABS latches and an O-ring seal. 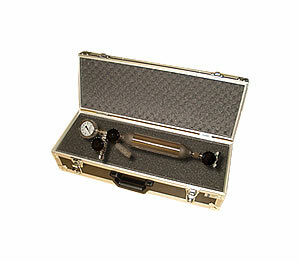 Cases are shipped with a customizable solid foam insert and have wheeled ends for ease of transport. 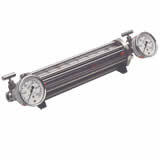 Sizes available are detailed below and will hold one (1) to three (3) cylinders dependent upon type and size.